The effects of hurricanes like Frances and Charlie can uproot Florida’s natural environment. Fortunately, the state has Y. Peter Sheng to pick up the pieces. Sheng, a professor civil and coastal engineering, leads research in areas like ecosystem restoration, hurricane mitigation and flood mapping, and homeland security in coastal waters. 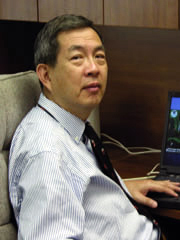 “Through his high-profile research activities and scholarly publications, Dr. Sheng has established himself as one of the world’s foremost experts in the field of coastal environmental monitoring and assessment,” says Joseph Tedesco, chair of the Department of Civil and Coastal Engineering. Sheng researches the physical and biogeochemical processes in coastal ecosystems and zones, where more than 50 percent of the Florida and U.S. population live. Because of pollutant loading, these areas have seen a significant amount of eutrophication or an increased amount of nutrients in the water. Natural eutrophication is a gradual process, but human activities have greatly accelerated the process. Sheng’s research has covered lakes across the state, from Indian River Lagoon to the Everglades. His models have also been used nationwide, including Chesapeake Bay and the Mississippi River.